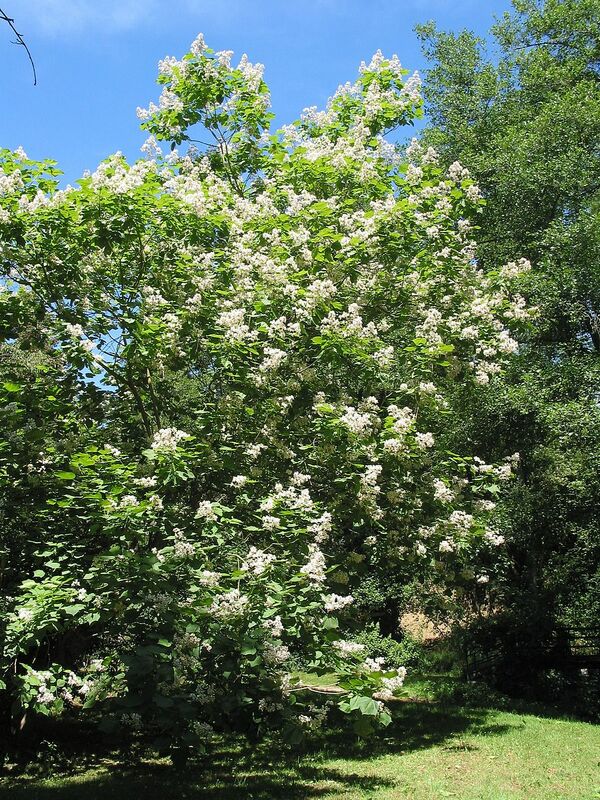 Catalpa speciosa tree in bloom. commons.wikimedia.org (Accessed 12/2017). 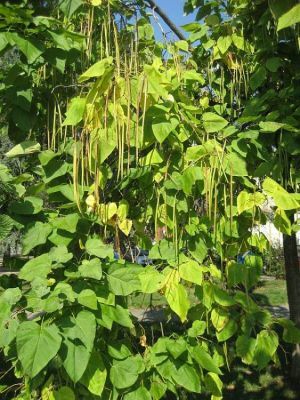 Catalpa speciosa is a tree to 30 m tall, pyramid-shaped, bark reddish-brown, thickly scaly becoming gray-brown, ridged and furrowed in older trees; leaf scars opposite, broad, nearly circular, vein scars forming a ring inside leaf scars. Leaves opposite, stalk 10-15 cm long; blade 15-30 cm long, 7-20 cm wide, egg to heart-shaped, tip long-pointed, base blunt to lobed, smooth above, densely hairy below, no odor. 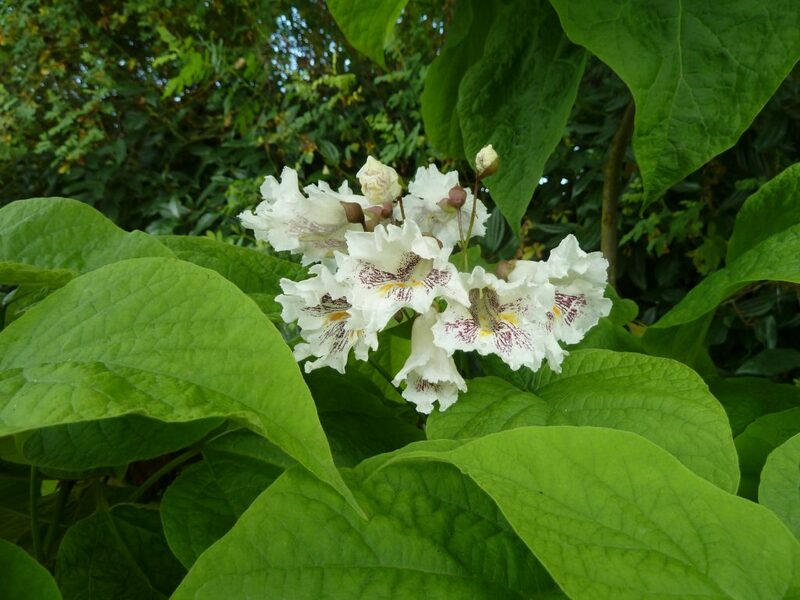 Catalpa speciosa.commons flowers.wikimedia.org (Accessed 12/2014). Flowers white, with 2 yellow stripes inside, faintly purple-spotted, 5-6 cm wide across top, broadly tubular, bilaterally symmetrical, lower petal lobe notched. Catalpa speciosa fruit. Franco Giordana. luirig.altervista.org (Accessed 12/2017). Fruit dry, hollow, linear, 20-50 cm long, 1-1.5 cm wide, seed wings rounded at ends with a flat hairy fringe. Origin: Southern mid-west US (Dirr 1990; Rehder 1986). Habitat: Escaped from cultivation. Open areas, edges, moist soil pH 5.5-7. Notes: may live about 60 years (USDA, NRCS 2010).